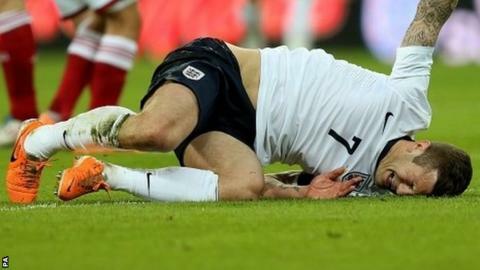 Arsenal midfielder Jack Wilshere will be sidelined for at least six weeks after fracturing his left foot. The 22-year-old was injured in a challenge with Liverpool's Daniel Agger in the 12th minute of England's 1-0 win over Denmark on Wednesday. He was eventually substituted in the 59th minute of the match at Wembley. He will miss Saturday's FA Cup quarter-final with Everton and Tuesday's Champions League last-16 second-leg tie against Bayern Munich. Arsenal then have a north London derby with Tottenham at White Hart Lane the following Sunday and also play fellow title contenders Chelsea and Manchester City before the end of the month. It was initially thought Wilshere had escaped serious damage after the Football Association carried out scans on Wednesday evening. It emerged the fracture was so miniscule that the scanning equipment inside Wembley Stadium failed to detect it when the midfielder left the pitch. A further examination by his club on Thursday discovered a crack in the navicular bone, which runs along the top of the foot. The news will no doubt have been a huge surprise to Wilshere, who confidently told reporters after the Denmark match that he was fine before speaking of his desire to finish the season strongly with Arsenal. "It is a bit sore, but just a bruise," he said. "I have had a scan already and I will be all right." Arsenal will be compensated for the injury by the FA and will not have to pay for Wilshere's wages while he is on the sidelines. Wilshere's career has been hampered by injuries, including a stress fracture of his right ankle that ruled him out for the 2011-12 campaign and forced him to miss Euro 2012. He has played 41 games for club and country this season, but served a two-game ban in December for an abusive hand gesture. Television pictures appeared to show him raising a finger towards the crowd during the 6-3 defeat by Manchester City.